Where to start?……. 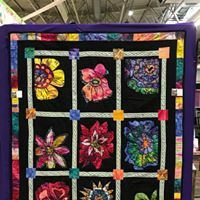 at the beginning, as an eager beaver beginner, scarred stiff when I looked at the displayed quilts, would I make something so wonderful and complicated, could I make even?! ……for many years I was just a visitor, jostling, bumping, stretching through between others, ferreting into low corners of stands to see what treasures could be found, buying copious amounts of fabrics and ‘stuff’!! There’s always room for ‘stuff’, stuff the ‘stuff’ in a little corner of one of the bags, you just need to remember which bag, what stuff and why…… was there a why, did I actually have a plan or just an excuse for the stuff?…… I love ‘stuff’!! Then it was entering quilts into the displays (competitions, nah!!! 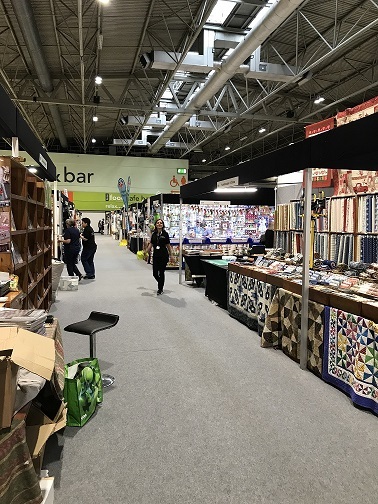 ….in truth I was just so chuffed to feel I was at a point where I felt I could enter, I really didn’t care what the judges might think, that was my quilt up there on display, embarrassed, but so chuffed!). Then off around the halls to do a bit of ferreting for stuff! 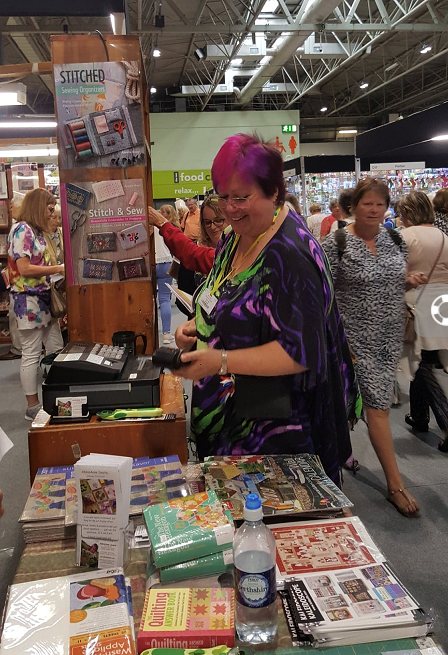 Then I went as a tutor, hour workshops, half days…… then went I search of stuff, ferreting into low corner etc etc etc……..
Then I went as a stall holder with the release of my book….signings, talking, smiling’s, patterns, kits, more books……. not a lot of ferreting, only the few minutes before you all arrived or just after you all left……. Another year included supporting the Quilters Guild raise funds, as a known tutor I was asked to donate an unfinished item I’d made for the anonymous sales table…. donate I did, then I was off like a whippet ferreting!! 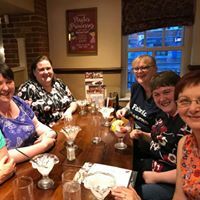 Now I go as ‘Me’ 🙂 over the years of ferreting for stuff I’ve met and made many friends within the quilting world, stall holders, tutors, organisers, and the lovely student public-type people…..loads of smiling now goes on along with natterings and many happy moments. I get to see friends from other countries, we party and exchange news and update each other on what we’ve made, what we’re making and why we’re buying all that lovely ‘stuff’! 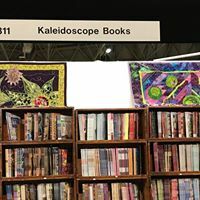 I also get to help one of the most popular stands at the show, the book and fabric stand, Kalquilts / Kaleidoscope Books. You’ll see my quilts all over their stand and me making an idiot of myself on the till, especially when I have no idea of a price!!! 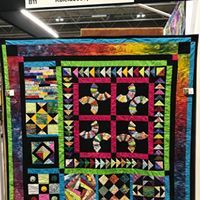 ….this was my very first taught/published Mystery Quilt, displayed here at the FoQ on the Kaleidoscope stand along with several other quilts……. Like so many of the stands, they’re run by a family firm, they take care of customers, they have the highest respect for their customers. Seems to me they’re possibly THE busiest stand in show, they get mobbed from the moment the show opens. It’s a place where people arrange to meet friends and travel companions after they’ve been off ferreting. Its where people head to just before they go home to pick up the heavier books so they don’t have to carry them around while they’re ferreting. And its now become a place where people head to say hello to me and find out what I’m up to!! I’ll be there again this year, please come and say hello, I hope to have two of the UKQU Mystery Quilts on display with me, maybe even three!! Dragonfly Quilt, A Colourful Outlook on Life and Rubies & Cream which will have gone public by then. The show means all manner of things to all manner of people. It’s a place to be inspired by, to meet and greet friends and like minded creatives. It’s a showcase for many small family businesses, designers, tutors and more, all people who need your support, your continued support, many are going by the by. Your support is what makes quiltshows happen. It’s you displaying your quilts and coming along to see them in their full glory. Without all the little creative businesses and quilt displays we would all starve of inspiration and stuff! Make sure you come and say hello to me!! 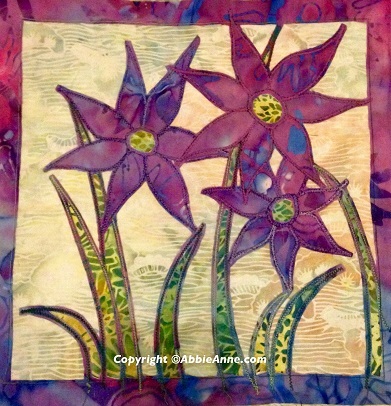 This entry was posted in bloglog and tagged Festival of Quilts, Kaleidoscope Books, Kalquilts, Patchwork, Quilters Guild, UKQU Mystery Quilt. Bookmark the permalink.